@Dirty Street Pie wrote: Sportsbet are VERY confident in Britt. 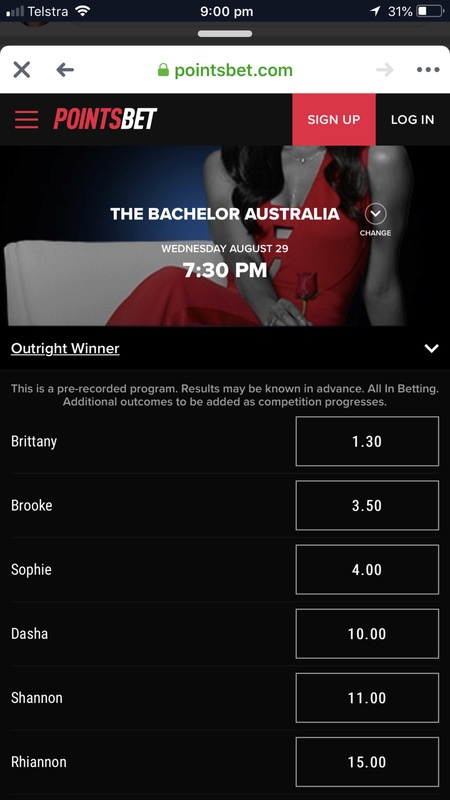 Her max bet is still $200, which gives a return of $320, while Brooke and Sophie’s max is $500, giving a return of $1750 for Brooke and $2000 for Sophie. They convinced me a long time ago. My only question now is whether Nick & Britt are still together. Maybe SB can open a market for that. I want to know why Brooke is in second place? Surely they have enough proof Sophie is in f2?? @LeapofFaith wrote: I want to know why Brooke is in second place? Surely they have enough proof Sophie is in f2?? Because the odds for anyone other than F1 don't matter. They only have to pay out for a winner. It's not like a horserace where they also pay for second, third etc. 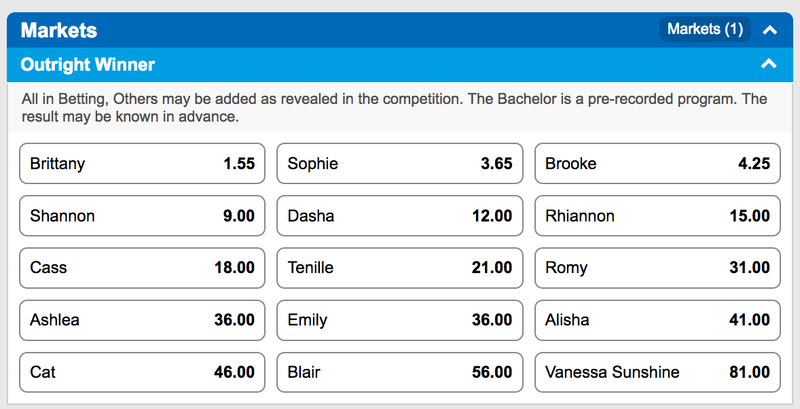 So they could theoretically have Vanessa Sunshine in second place at 1.65, or Sophie in last place at 500.00 - it wouldn't matter to Sportsbet, because they're not going to be paying out on those places. The odds for F2 down are purely for show. They are essentially trying to trick people into placing bets, so they can make more profit. So they work out odds that seem believable, to lure in punters. 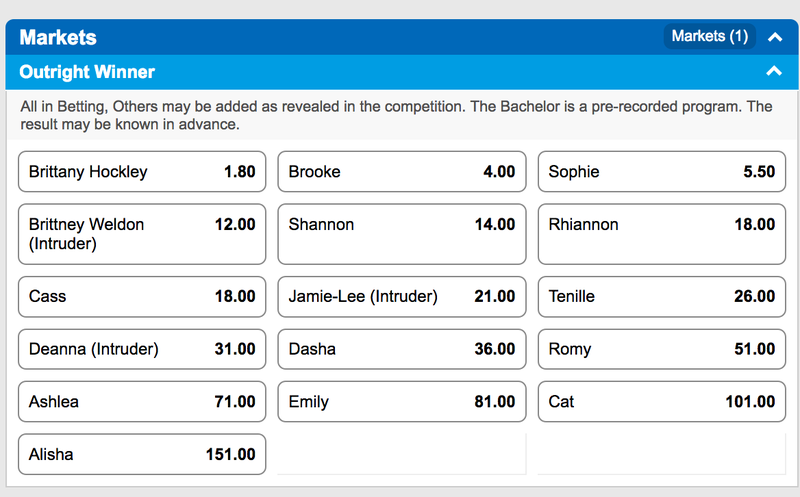 At the moment, if you were only watching the show without doing external research, Brooke would seem like a front runner, so they make her odds seem like she COULD be the winner. That's also why the max bets for everyone other than F1 is so much higher - they want people to place BIG bets on the "losers" because that's cash in their pockets. It's all a big mind game. i just saw this tweet of a betting site on whether Nick will propose, I guess we will see if sportsbet adds that as an option to bet on. Marital bliss for the Honey Badger? Different betting agency but look at the odds. 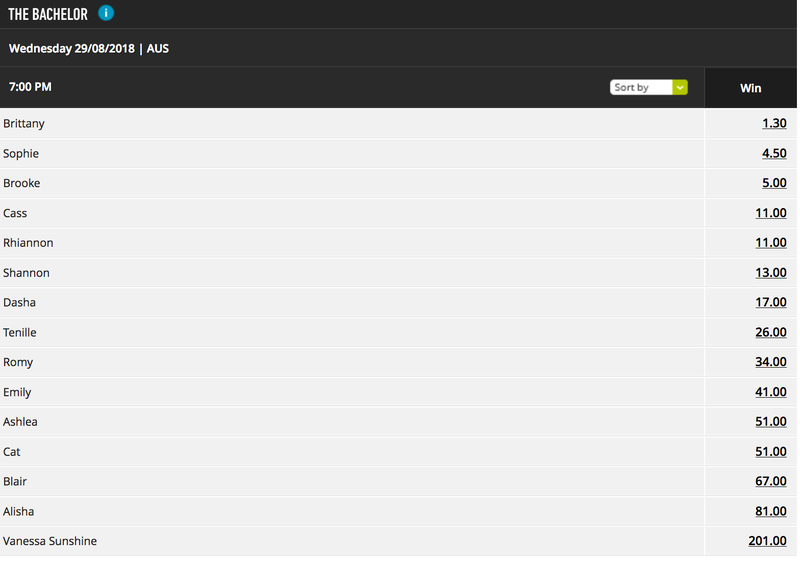 Gotta love Sportsbet releasing odds for the intruders even though they've had practically zero screentime so far. They could at least pretend there's some kind of rationale for their figures besides insider knowledge of who wins. why has Brittany gone up to $1.80? was she not $1.45 i don't know if i have ever seen that before?? Hypothetically what happens if Britt is not the F1? @LeapofFaith wrote: why has Brittany gone up to $1.80? was she not $1.45 i don't know if i have ever seen that before?? - They've dropped her max bet to a level where the overall max loss is still exactly the same, or even less. The max bet as calculated upthread by @Dirty Street Pie was previously $200 at odds of 1.60, giving a max loss of $320 (200 x 1.6). If, hypothetically, they've dropped her max bet to $180 at 1.80, that would make a max loss of $324 - practically the same. If they've dropped the max bet even further, that would make her even MORE of a favourite, e.g a max bet of $150 at the current odds of 1.80 would be a loss of $270 - less of a loss for Sportsbet than when the odds were 1.60, i.e they are even MORE confident she wins. Does that make sense? I don't have an account so can't check the max loss, but I suspect that's what they've done. No worries. I've never been a betting woman but I find the statistics and mind games of it all very fascinating. Maybe I was a bookie in a past life.